Last week, we discovered a shockingly pristine Toyota Supra Turbo on Bring A Trailer. Despite three owners, the car only had racked up 5,664 miles, was kept entirely stock, and had about as clean of a record as you could pray a car would have. 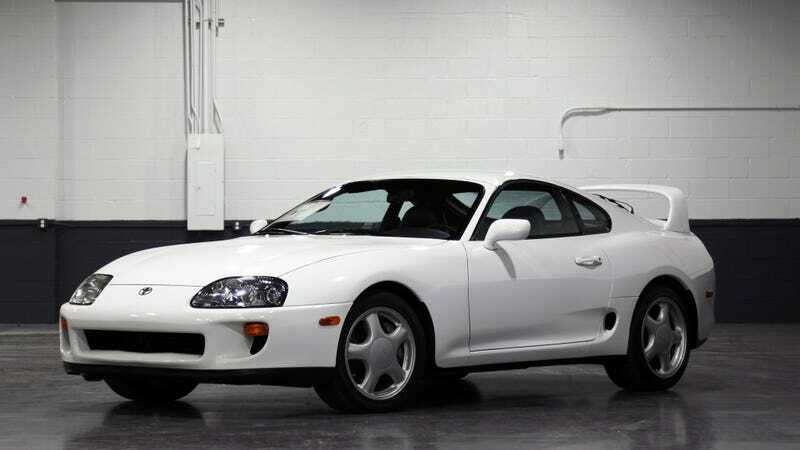 At that time, someone had already bid $50,000, a pretty standard going price for a Supra. It ended up selling for a lot more, or $80,500 to be exact. Finding a Supra that clean, with no modifications, is pretty damn impossible. They’re a favorite for modification, so it makes sense that people would fall head over heels for a stock Supra that just looks so immaculate - even it if is an automatic. Twenty-seven people bid on the final product, which isn’t a high number, but you just know every single one of them was a high roller. That $80k is just about the price it sold for when new, accounting for inflation. The car is pictured with a window sticker reading $47,795, or about $84,000 in today’s dollars. All things considered, nearly making the price the original owner paid for a brand new car for a used one isn’t half bad. Aside from its stock status, the Supra is also white. White, black, and gray are the most common resale colors, but the white really highlights how well this one has been taken care of because you would definitely be able to see any imperfection—and this one looks pretty much perfect. Similar Supras in black weren’t quite as big of a hit on BaT, but I’m thinking that the white played a big part in the $30,000 difference.